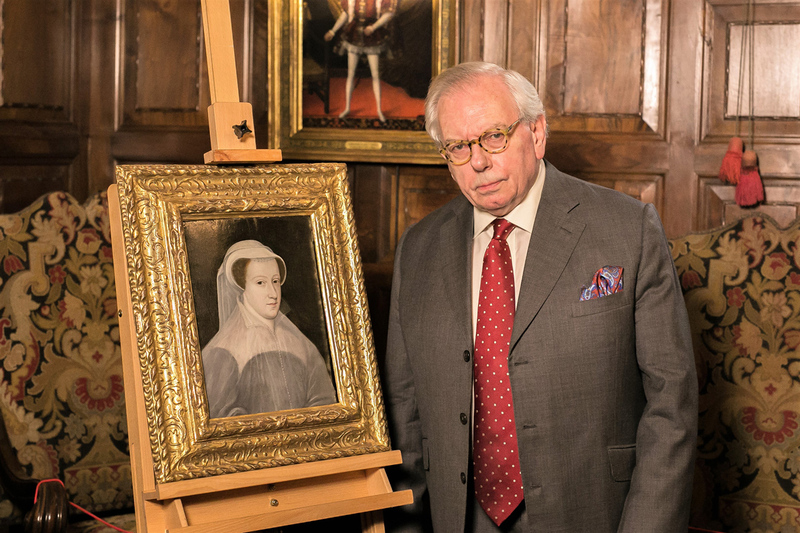 Speaking last week with ATG in Hever Castle in Kent at the unveiling of a lost portrait of Mary Queen of Scots (1542-87), history professor, author and broadcaster Starkey was referring to Mould’s discovery of the picture in 2014, mis-catalogued at a French auction. Mould identified the portrait as being 16th-century from the studio of François Clouet, a court artist who painted the French ruling family, and is reported to have purchased it for less than £10,000. The portrait is one of the very few painted during Mary’s lifetime. In the 2014 auction, it had been catalogued as a 17th century portrait of an unknown woman by an anonymous hand. Professor Starkey said the portrait’s authenticity “is beyond doubt”. The picture is close in style to a Clouet drawing of Mary, part of a master drawings series undertaken when he was French court artist. Mould commissioned dendrochronological analysis (tree-ring tests) of the wooden panel on which the portrait is painted and spectrographic analysis of the paint’s pigments. Having authenticated the picture, Mould then sold the portrait to Hever’s owners, the Guthrie family, nearly two years ago. The Guthries, owners of property group Broadland Properties, “look at every major historical portrait that comes on to the market,” Professor Starkey said. The unveiling on Friday, 8 February at Anne Boleyn’s childhood home, was on the 432th anniversary of Mary’s execution in 1587, carried out on her cousin Elizabeth I’s orders. A new film, Mary Queen of Scots, has just been released, but Duncan Leslie told ATG that timing was “a coincidence”. The portrait joins the Stuart section alongside an ever-growing collection of Tudor portraits at the Long Gallery at Hever, the childhood home of Anne Boleyn, mother of Elizabeth I. Most depictions of Mary were done after her death and post- the accession of her son, James VI of Scotland, to the English throne in 1603. She is depicted wearing white mourning dress on the death of her husband King Francis II in 1560. “This elegant portrait shows the 19-year-old Mary, as she was on her return to Scotland at the beginning of an extraordinary adventure which turned two kingdoms upside down and ended in her own execution at Fotheringhay 26 years later," Professor Starkey said as he unveiled the painting.